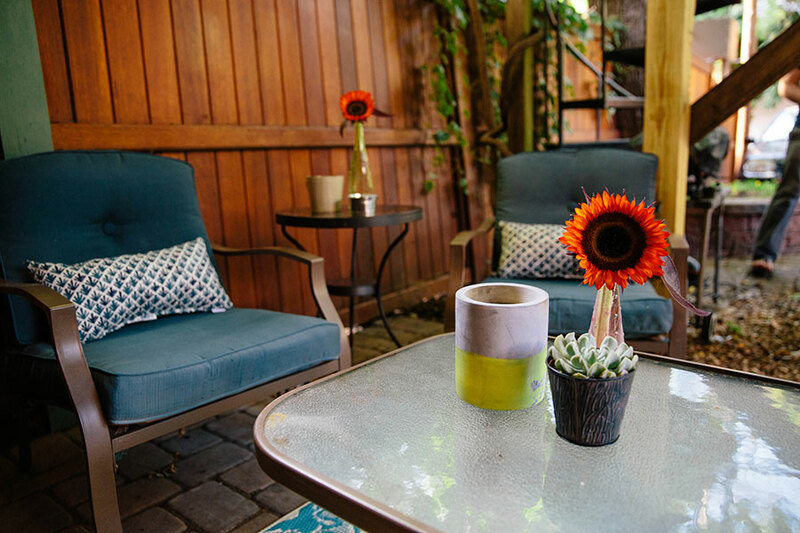 We feel very fortunate to have outdoor space while living in a city. 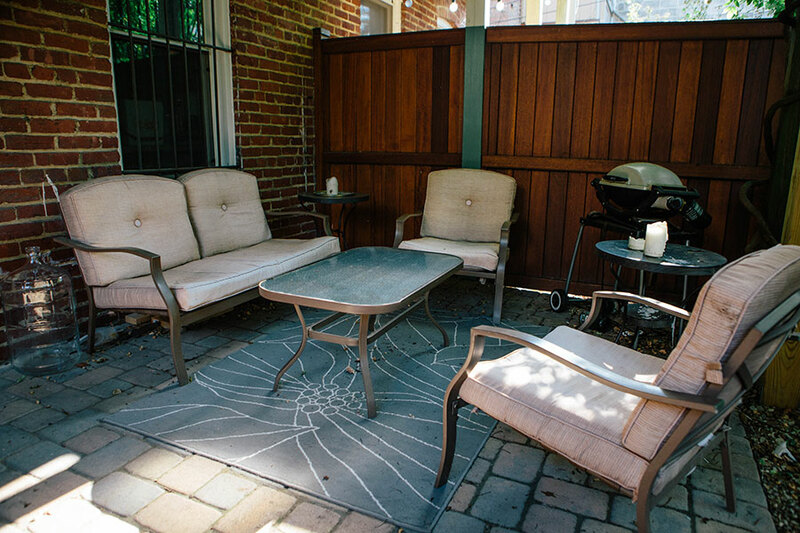 Our back patio was huge selling point when we were looking for apartments to rent in the Washington, DC area and we had to compete with a lot other potential renters when we applied for this space! I love sitting out on the patio with friends on warm, summer evenings and sipping wine under our Christmas lights. It’s probably one of my favorite parts of summer! 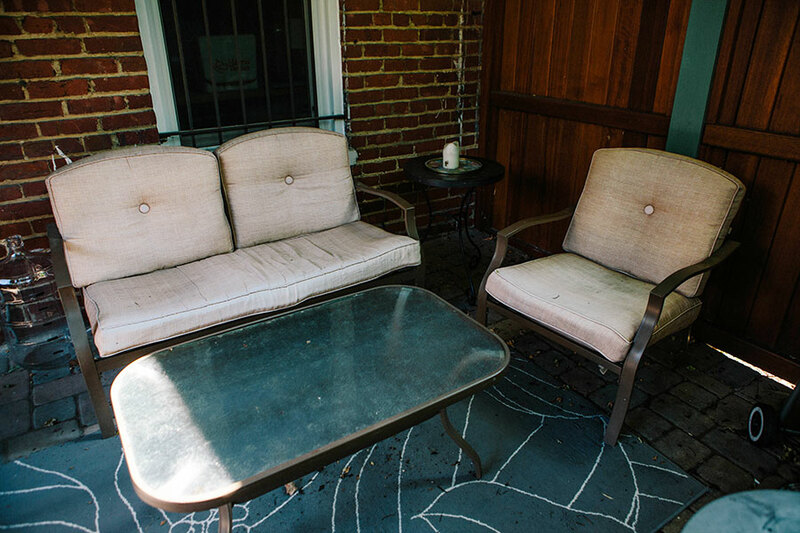 Our 4 piece patio set was found on Craig’s List for $50 last summer and though we loved the price, the cushions were in pretty bad shape. Their previous owners left the cushions out for several winters, which left them faded and worn. The tan color was also not my first preference. 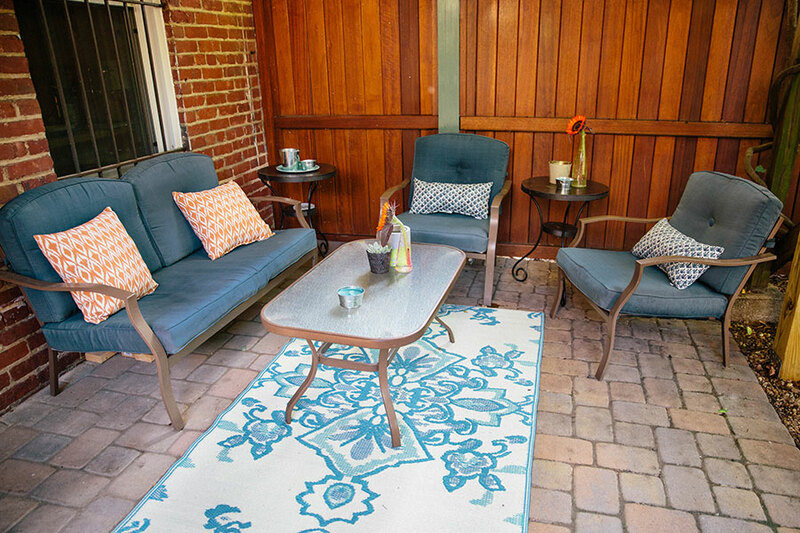 The rug was from Ikea a few years ago and is actually meant to be indoors, but we had it out there as a temporary solution. Our poor pillar candles had also seen much better days. We tried buying new cushions for the patio set, but the frames were an odd size and nothing fit well. Not to mention, the price of new cushions had us wondering if we should just buy a new set all together. My solution? Fabric Spray Paint! No really. 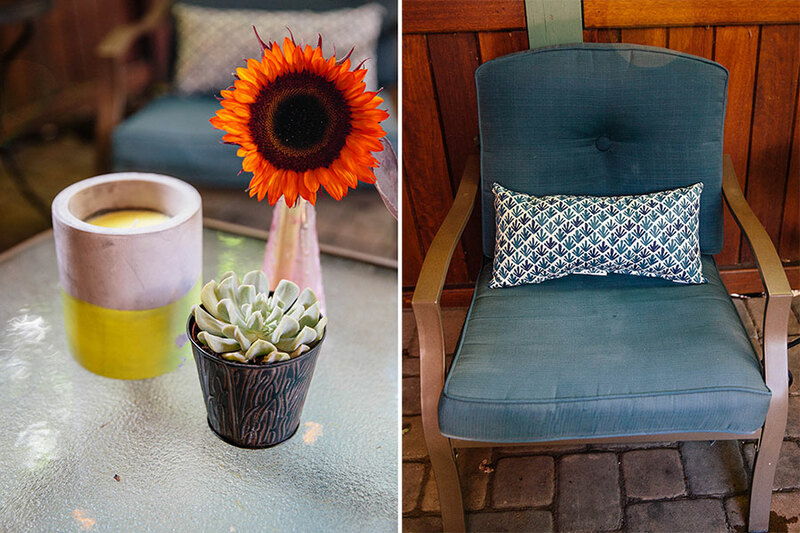 I’d heard of dying upholstery and began wondering if I could dye my cushions a new color instead of buying new ones. During my research I came across this Fabric Paint and decided to buy a few cans in navy blue. I was pretty nervous about spraying the cushions and wondered if spray painting fabric was too good to be true. After the first coat, I was even more nervous because the color was looking a little too bright and the paint looked very patchy. However, after applying a second coat, I was pleasantly surprised by my new blue cushions! I let them dry for about 36 hours before attempting to sit on any of the cushions and am very happy with the way my patio now looks! My thoughts on the Fabric Spray Paint after the project? 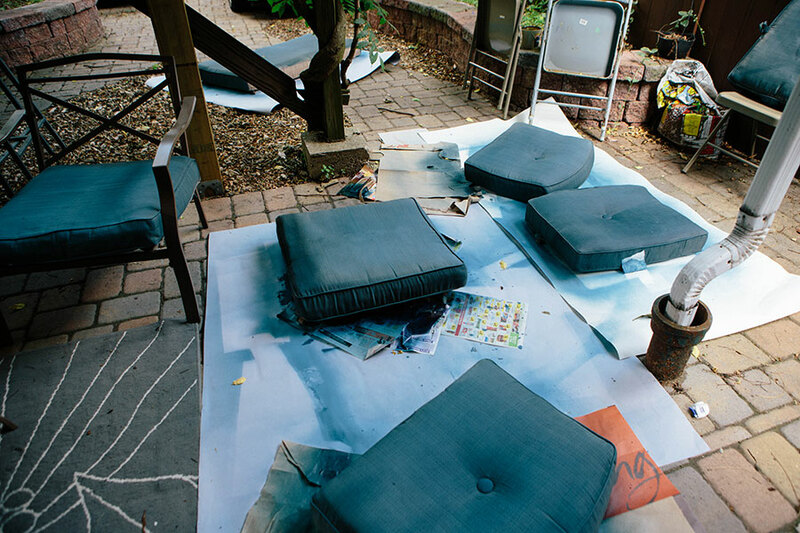 Overall, I am happy with the way the spray paint worked for our patio cushions. Biggest cons? In order to get a ‘non-patchy’ look you need to use A LOT of paint. We used 6 cans, but I think I may buy a couple more in order to get a more even coverage and a darker color. The nozzles clog fairly easily, making your paint spray in strange directions, but they provided two replacements in the box, so I that made up for it! Bottom Line: It’s not perfect, but it’s an easy fix and cost me much less than buying new cushions! I would do it again! What do you think? 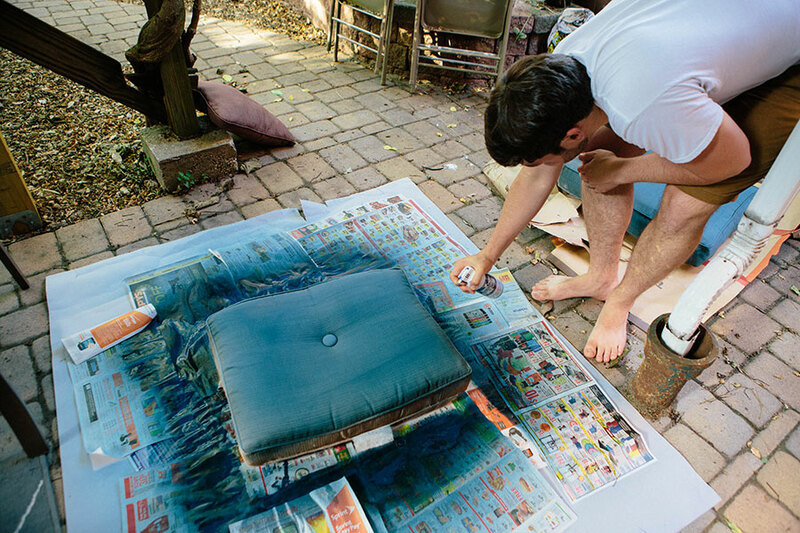 Would you try spray painting your furniture? !